Biodegradable There are 2 products. Maxifluid 46 BBO is a synthetic, ecological and biodegradable, high quality microfiltrate hydraulic fluid specially formulated to work in systems that operate at high pressures. 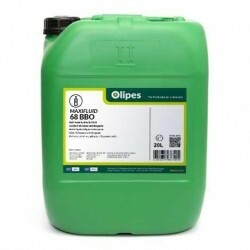 Maxifluid 68 BBO is a synthetic, ecological and biodegradable, high quality microfiltrate hydraulic fluid specially formulated to work in systems that operate at high pressures.